It’s no secret: men and women are different, particularly when it comes to health care needs. In honor of Women’s Health Month in May and Men’s Health month in June, Digestive Health Reno has the scoop on how to optimally manage your GI health by gender. A man’s digestive system is less complex, and only has to share the abdominal cavity with his prostate and bladder. Monthly hormonal fluctuations and pregnancy changes aren’t an issue for men, either. While fewer men suffer with IBS, the incidence of colon cancer is slightly higher among men (4.7% vs. 4.4% in women). The difference may be because of the protective effect of estrogen against certain cancers observed in some landmark women’s studies. Men are often diagnosed with polyps at a younger age, too, so it’s important to avoid delaying that first-time screening colonoscopy beyond age 50. 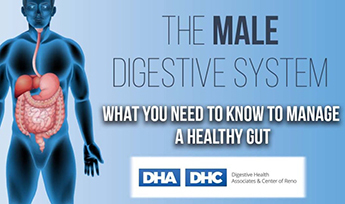 Men are more frequently diagnosed with GERD-related diseases, yet less likely to report symptoms than women – which may be why men’s conditions often progress to more serious diseases like esophageal cancer. The message is: don’t ignore symptoms – seek advice, to ensure an early diagnosis and treatment or prevention. Regardless of gender, a gut-healthy diet is same. The Male Diet: Due to higher testosterone, men are more prone to abdominal weight gain, increasing their risk of chronic diseases like diabetes and heart disease. Men should avoid a high intake of fatty animal proteins. Whether you’re a man or a woman, you deserve the best GI care. Digestive Health Associates and Health Center Reno are staffed by some of Reno’s leading board certified, gastroenterologists and a medical team that specializes in gastrointestinal health. Get top-level, expert care that fits your budget, and enjoy the comfort and convenience of safety-certified facilities, accessible parking, and curbside patient drop-off and pick-up. Visit our website to learn more or schedule an appointment, or call (775) 600-4717.